Page Publishing’s new release solves the mystery of how human-nature originated, and why it evolved to be so evil and terrifying that it made the world the self-destructive way it was and is to this day. 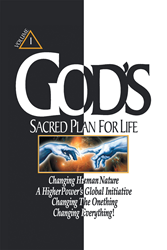 The author clearly states that changing mankind’s self-destructive nature, healing The Human- Condition and saving The Human Empire from experiencing a total global collapse is what the knowledge, wisdom and purpose of “God’s Sacred Plan For Life” is for. Its mission, then, lives in reaching out to a global population in crisis at this psychological tip- ping point in man’s short malevolent history, when the emotional, physical, moral, financial, poli- tical, self-analytical and spiritual needs of people has never been greater. As such, God’s plan for life, not death, was made manifest by A-HigherPower to change the suicidal course of man’s thinking, behavior, relationships, politics, world view and future before death recycles us away. Ronald goes on to say that there is but one way to make mental illness ( depression ), physical sickness ( addiction ), and spiritual disease ( suicide, genocide and war ) relics of the past --- And that’s by changing everyone’s egocentric self-image! Making what people believe is impossible possible, God’s plan will prove to be the mother of all SELFhelp, SELFhealing and SELFtrans- formational technologies for one unprecedented reason. It reveals what all people must know now, that was forbidden before. The knowledge of ‘God’s Dual Nature’ that clergy insist is unknowable. The reality of ‘Man’s Bipolar Nature’ that psychoanalysts contend is genetically defective, and the truth of ‘DNA’s Dual Nature’ --- The cosmic connection linking the spirit of God to the body of man; causing the individual conflicts and collective wars between the forces of good ( God’s will ) and evil ( man’s desire ), driving humanity to the brink of extinction from the beginning. Concealing the knowledge of good ( God ) and evil ( man ) that the first earthlings were forbid- den to know caused their descendents to destroy themselves and their civilizations time and time again. Revealing what was taboo in the beginning will change egotists into spiritualists ---Stopping us from destroying everything that we love and cherish most in the end! “God’s Sacred Plan For Life” is the greatest love story ever told about the triumph of good over evil. Seekers of reality will find their truth and in so doing know how to make the changes that they need, happen, for the first time. Readers choosing to change can purchase “God’s Sacred Plan For Life” at bookstores or on Amazon Books and Barnes & Noble.com by googling its name. It may also be purchased as an ebook on Amazon, The iTunes Store, Google Play and Kobo.